'Toilet: Ek Prem Katha' looks less like a sincere effort to deconstruct and depict a complex reality, and more like an attempt to sidle up to one particular political party. The most interesting – and the most heartening – bit about Akshay Kumar’s latest, Toilet: Ek Prem Katha, is that it’s devoid of a villain. We don’t need one, the film suggests at one point, for we’ve been letdown by our people’s insistence on “sabhyata (civility)” and “sanskriti (culture)”. It’s an argument that merits some attention, more so because it comes in a Kumar film, which is usually known for its nationalist fervour. It’s also a rare instance of a Hindi film looking inwards, telling us that instead of holding someone else responsible for the quandary we find ourselves in, maybe we ought to look in the mirror more often. It’s a pity, however, that this line of inquiry, or introspection, pops up in a film that doesn’t have a lot going for it otherwise. Toilet: Ek Prem Katha tells the story of Keshav, who owns a bicycle repair shop in Mandgaon, a village on the outskirts of Mathura in Uttar Pradesh. He falls for Jaya (Bhumi Padnekar), a college graduate and ultimately marries her. Mandgaon, like many villages in the country, has limited regard for personal or communal hygiene. It’s a place where women walk to a field at 4 am to defecate in the open. Men, on the other hand, relieve themselves near their houses. A headstrong woman, Jaya, who grew up in a house with a toilet, refuses to debase herself like other women of the village. Keshav’s father though, an old-fashioned Brahmin, can’t bear the thought of constructing a toilet in his house. The film ultimately comes to this – if Keshav wants to save his marriage, he needs to build a toilet. The film’s premise may seem absurd at the outset, but it’s not, for it has its roots in a long-standing social reality. There’s definitely some promise in this story – which is quintessentially Indian – but it’s often let down by its writers (Siddharth Singh and Garima Wahal) and ultimately, filmmaker Shree Narayan Singh. A film like Toilet: Ek Prem Katha – which aims to tell a compelling story, underlined by tones of activism – almost follows a template of sorts. The first act introduces the characters and stakes, the second act escalates the tension, followed by a climax, which posits a solution, neatly tying all the stray strands together. These films – almost a sub-genre of their own now – do recognise a problem, but they race towards their resolution with such effortless clarity and simplicity, giving an impression that this country doesn’t need conscientious politicians but socially-conscious filmmakers. 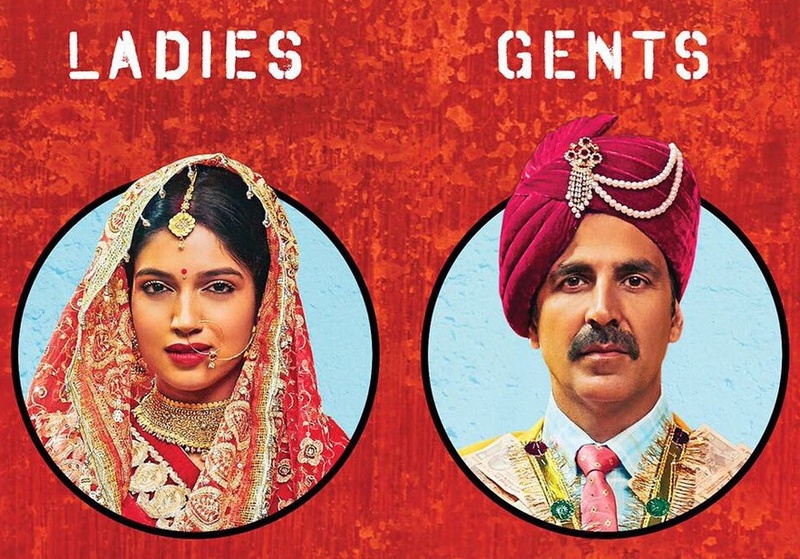 Toilet: Ek Prem Katha, quite unsurprisingly, suffers from the same problem, but it also falters while telling an entertaining story, for it’s marked by tired tropes and lazy writing. Keshav, like many heroes from the films of the ’90s, has a sidekick, Naru (Divyendu Sharma), whose only purpose is to inject humour in the movie. The subplot of Jaya falling for Keshav, after an impassioned monologue by the guy, is completely unconvincing. Any scene of considerable emotional heft is underlined by a song. We’ve seen these conflicts, scenarios, songs, in numerous Hindi films before. So Toilet: Ek Prem Katha’s tired set-up does precious little to move us, or plant us firmly in a milieu. The film gathers some steam in its latter portion, when it’s trying to not just see the problem, but also attempt to understand its origins, questioning the meanings of tradition, religion and culture. It’s refreshing to see a mainstream Hindi film, revolving around a star, that isn’t centred on people vs state, but people vs people. It is ready to call out the hypocrisies of religion (“Hum phanse hue hain dharm ke andhe khel mein (we’ve been shackled by the pointless games of faith),” says Keshav at one point) and examine the status of women in our society, oppose jugaad, quick-fix solutions, a very Indian way of living. The film is ready to show us the mirror and essentially say this, “It’s high time we change the way we live.” However, this promising segment – barely lasting for 30 minutes or so – is short-lived, failing to elevate a largely indifferent and ineffective drama. Toilet: Ek Prem Katha frequently gets tied in its own knots. On the one hand, it looks down on easy solutions and yet, it naively believes that people, and their attitudes, can be changed quickly (as evident in a scene where the women of the village are ready to upset the status quo after watching interviews of Keshav and Jaya on TV). It stands up for progressive gender politics and yet it upholds a regressive ancient text, Manusmriti, to buttress its claims. In one scene, the village’s sarpanch quotes Manusmriti, saying it supports open defecation, to which Keshav responds that the text also says to not dump near a pond or a lake, or wash one’s hands after the act. A feminist film taking the side of Manusmriti seems bizarrely contradictory and upsetting. And after a while, when the film has shoehorned its motif of it’s-not-the-government-it’s-you, you see where this affair is headed and what its political colours are. Toilet: Ek Prem Katha begins by thanking the Swachh Bharat Mission and its subservience towards the current dispensation starts becoming clear by its final act. Sure, it talks about the government’s misdoings, including the 2012 “Rs 2,900 crore toilet scam” and the corrupt bureaucrats, and yet, at the same time, steers away from recognising the other challenges of solving a problem as complex as public sanitation. You can tell a story in whatever way you like, but cherry picking parts of a narrative that makes a political party look good is a little too convenient (and at its worst, misleading). In fact, if it wasn’t already clear, a scene in the film supports demonetisation. In the climax, the UP chief minister says that the files for building toilets in the villages have to be circulated through seven offices, and if the bureaucrats are so corrupt and indifferent, then the toilets in their offices should be shut to teach them a lesson. His secretary wonders whether that’s even possible. The chief minister says, “If our PM can do note-bandi [demonetise notes] for the benefit of the country, can we not shut toilets?” The mention of the prime minister’s nobility, popping out of context, is both laughable and cringe-worthy. But, over the last year or so, this has become a pattern of sorts. A scene in Half Girlfriend has the hero, Madhav (Arjun Kapoor), praising the prime minister’s Beti Bachao, Beti Padho Yojana. Varun Dhawan’s character in Dishoom says, “Naukri karta hoon inki, sunta hoon Modi-ji ki (I work for them, but I listen only to Modi.” Heck, there was an entire film on demonetisation – Commando 2. A film is obviously allowed to have its own political views, but when the mention of a prime minister (and, in effect, a political party’s initiative) comes up without a context or reason, it veers towards propaganda. It’s all the more problematic, because neither Toilet: Ek Prem Katha nor any of the aforementioned films are nuanced portrayals of problems plaguing modern India. And so, as a result, these nods look less like sincere efforts to deconstruct and depict a complex reality, and more like an attempt to sidle up to a particular party, while telling a simplistic story in a heavy-handed fashion. Toilet: Ek Prem Katha could have been a much better film had it looked beyond the headlines.